This Independence Day we had the talented Akasa Singh (Singer & Performer) Taaruk Raina (Actor) Tony Schienap- (The CEO of MOSAIC & South African Actor) , Sakhar Nair - (Head Of Middle School at ASCEND INTERNATIONAL HIGH SCHOOL, also a Social Worker) who graced our event as Chief Guests. Our children danced on patriotic songs, bringing emotions for our motherland and its freedom to life. Our volunteers too performed to celebrate and make the event more lively and enthusiastic. Educating children to plant trees is also about teaching them to think about life and the environment. We, at Kutumba Foundation strive to educate underprivileged children and help them reach their potential through various activities. 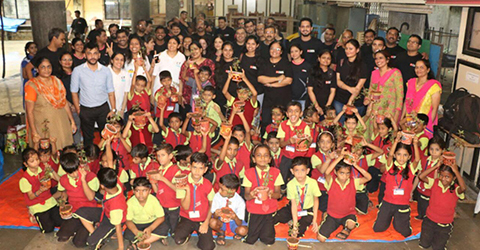 We would love to thank DBS Bank for conducting a "Tree Plantation and Awareness" as a part of their #CSR activity for our children yesterday. 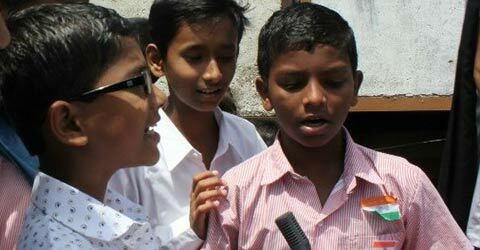 These talented kids also enacted a short skit on the "Importance of trees". We are also grateful to ConnectFor for supporting Kutumba and providing our kids with opportunities to learn new things. 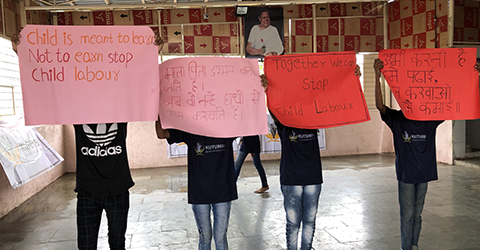 We, at Kutumba Foundation, took a small step towards the "World Day Against Child Labour" to create awareness and educating parents, children and the nearby school teachers about child labour through thoughtful skit and dance performances by these very much talented children. 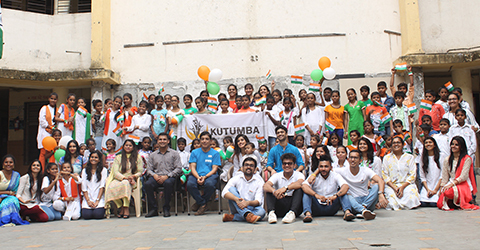 Sporting inspirations participating in the Mixed Martial Arts tournament of Super Fight League SFL visited and interacted with Kutumba Education And Knowledge Foundation children at our Worli Centre. 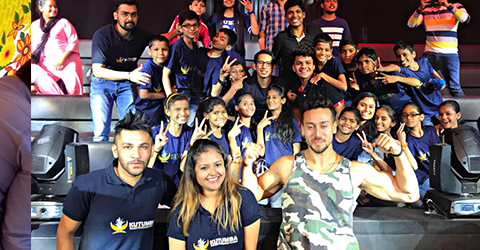 SFL (SUPER FIGHTING LEAGUE) & Tiger Shroff promoting our foundation at an event in mumbai, famous studio. Kutumba Education and Knowledge Foundation, would like to extend a wholeheartedly thank Chandigarh cubs for supporting and furthering our cause during their popular event- ‘The Box Cricket League’ held at Goregaon on February 12 . Pictures depicting our children at Kutumba enthusiastically performing the roles of inspirational leaders such as Mother Teresa,Mary Kom and former president APJ Abdul Kalam during RepublicDay celebrations organised by our volunteers. 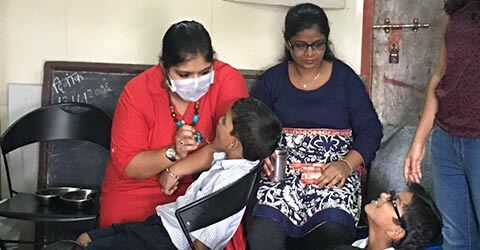 A medical camp was organised for underprivileged children affiliated with Kutumba identifying the most common illnesses and the necessary treatments for them. It was an early Christmas for the kids. There was joy, love and merry all around. 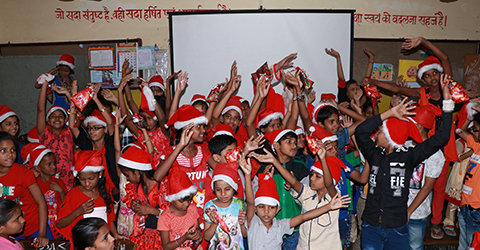 Gifts were distributed, kids danced and performed to the pulsating music with Santa. All in all it was a great Christmas Bash. 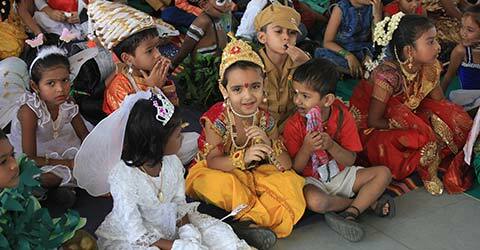 This Children's Day had a whole new meaning & destination for the HappyFaces of Kutumba. Our children were invited to celebrate Children's Day by INOX Leisure Ltd, Marine Lines, a company dealing in real estate, ANAROCK Property Consultants Private Limited at BKC & by Bhaskarrao Vaman Thakur Education Campus, Virar. It is a known fact that “Cleanliness is next to Godliness”; which has further gained emphasis in India through the “Clean India – Green India” and Prime Minister’s “Swachh Bharat” campaigns. 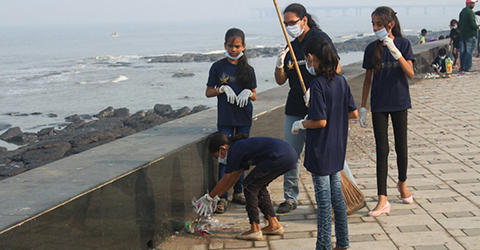 A clean environment works wonders in numerous ways not only resulting in better health and sanitation but also internal satisfaction.The clean up drive held last Friday at Worli Sea Face was successfully possible with the cooperation and assistance forwarded by local BMC officials. 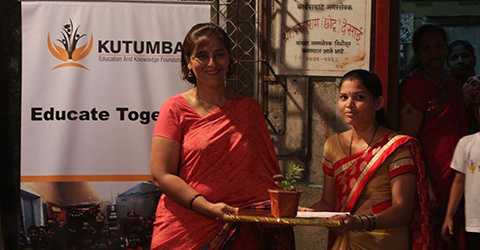 The drive was undertaken by 40 slum kids, 7 volunteers of the Kutumba Education and Knowledge Foundation NGO and BMC cleaners and carried on for approximately one hour. 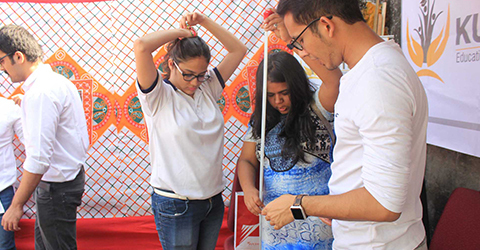 The primary purpose of this activity was to highlight the importance of cleanliness to the slum kids as well as instil appreciation in their minds and hearts for the cleaners who work tremendously hard to better the city. 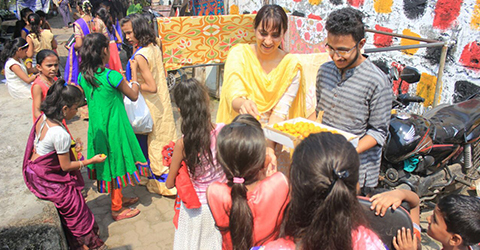 The proceeds collected from the sale of diyas was utilized towards expenses incurred for a Diwali Party organized by Kutumba Education and Knowledge Foundation for the under privileged kids. The party concluded with handover of Diwali gifts to the children; i.e. bracelets and earrings for girls and t-shirts for boys which ensured them departing with a huge smile on their faces. All this was not possible without the heartfelt contribution by the purchasers of diyas/donors. 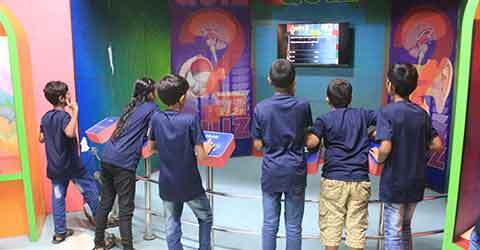 Kids had a fabulous experience at Nehru Science Centre along with Kutumba volunteers & Rotary Bombay Bay View members. Diwali preparations with our kids. 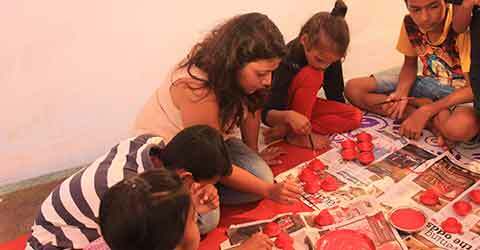 They all participated in diya making activity with the volunteers at our centre. 15th August 2017, India will celebrate its 71st INDEPENDENCE DAY. On this historic day, KUTUMBA FOUNDATION has the privileged to host our chief guest DR. Swapna Patker (Writer, Film Producer, and Entrepreneur) followed by flag hoisting ceremony. We intend to share the glory of this day with our children by enlightening them with the importance of our Independence Day. 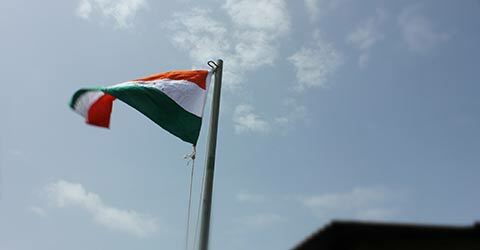 We cordially invite you all to be a part of flag hoisting ceremony. 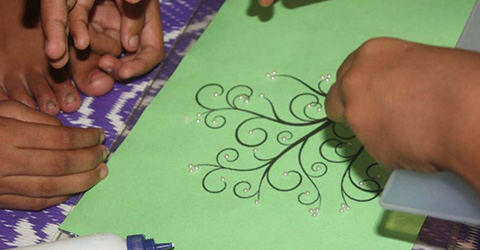 Summer vacations in schools provide children the time to indulge in extracurricular activities and explore the horizons. 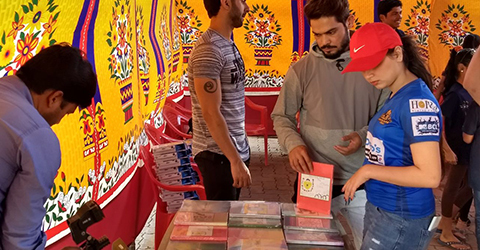 The children participated in activities pertaining to arts and crafts like calligraphy and drawing along with workshops for public speaking. The festival of colours brings a message of joy and a sense of community. 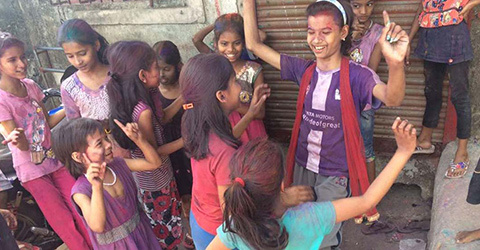 The children joined in on the celebration of Holi and enjoyed the day to the fullest. A mix of practical and theoretical approaches contribute to a more wholesome growth. The time at the aquarium encouraged the children to wonder about aspects of life not often covered in classroom discussions. 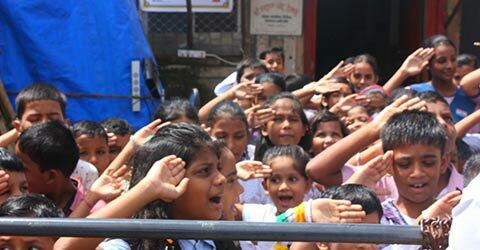 The celebration of Republic Day inculcates a sense of patriotism while making the children aware of nation-building. We also made an attempt to provide the children of a better understanding of their role in that pursuit. 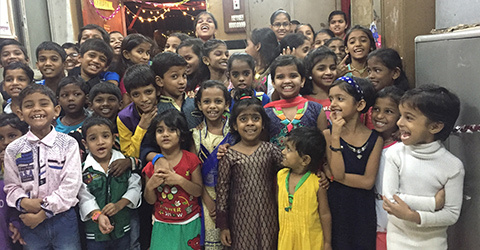 The Inner Wheel Club of Mumbai joined hands with us on this occasion to make this day more enjoyable for the children. The children were encouraged to draw pictures on the theme of Children's Day to further explore their creative potential. 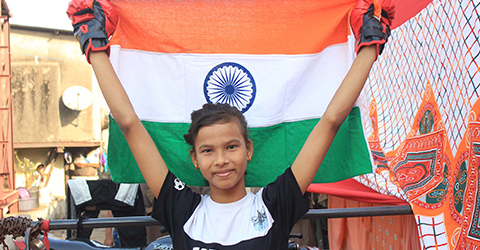 As India celebrates her 70th Independence Day, we hope to motivate the children to follow in the footsteps of those that have contributed in making India what it is today. Healthy Teeth make the best smiles". 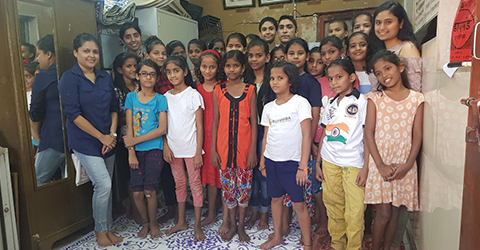 Kutumba Foundation volunteers in Mumbai, Worli held a Dental Camp where over 50 children attended this camp along with Dr. Asawari Joshi who came to support the cause.